In addition to the quality and innovation of their work, much of AMD&E’s success can be attributed to their ability to serve a broad customer base: aerospace, automotive, oil & gas, energy, pharmaceutical, bio chemistry, bio technology, automation, and other general industrial markets. From its inception, AMD&E needed computer workstations capable of not only supporting light duty SOLIDWORKS tasks, but also analysis, simulation, and rendering. In the beginning, they rolled the dice on Dell 690 desktops and Precision mobiles as the best options available (without spending on high end systems). Unfortunately, the result was less than adequate. As Tingley discusses the complications and level of frustration that arise from relying on inadequate tools his tone turns more serious—especially when he recounts the events of 2009.“That year we had a number of large projects running simultaneously and each one required the design of large assemblies and massive amounts of finite element analysis,” he recalls. “Every day, we spent hours waiting for meshes to update and simulations to solve, and more hours waiting for large assemblies to open and drawings to update. Each one took between eight and twelve hours. If we didn’t mesh the model correctly, we may not know that for four hours. Or if we applied a boundary condition incorrectly, we may not know that for eight hours. Every error we made, we wouldn’t find it until the next day, so we lost a day for every mistake. In addition to that, we just had so many simulations to solve that we didn’t have enough hours in the day. I have to applaud our team. We had guys that pulled multiple all-nighters in a row in order to hit deadlines. If not, we would have missed the deadline and probably lost the contract. We could have lost our entire customer base and reputation, so we did what we had to do to keep that intact, but it was all at the toll of our staff. I knew that wasn’t going to work as a long term strategy. In search of a solution, AMD&E conducted testing on the latest Dell and HP workstations and carefully reviewed both manufacturers’ SOLIDWORKS standards performance tests. After thorough evaluation though, they found themselves right back where they started. “Dell and HP didn’t do any better than what we already had,” says Tingley. “We would’ve invested significant dollars and gained zero improvement.” The firm was looking for solutions that would provide the necessary performance with the mobility to work where their clients were located (or where the challenges arose). They also evaluated MySolidBox, @XI, and MSI—all to no avail. Following further fruitless evaluations of MySolidBox, @XI, and MSI systems, an online search led Tingley to an article in Desktop Engineering (now Digital Engineering) magazine. After reading it, Tingley made a phone call to BOXX and was immediately struck by the difference between the discussion he had with a BOXX performance specialist and previous conversations with other hardware manufacturers. “With Dell, it was apparent that they had a sales pitch, but didn’t really understand our challenges,” says Tingley. 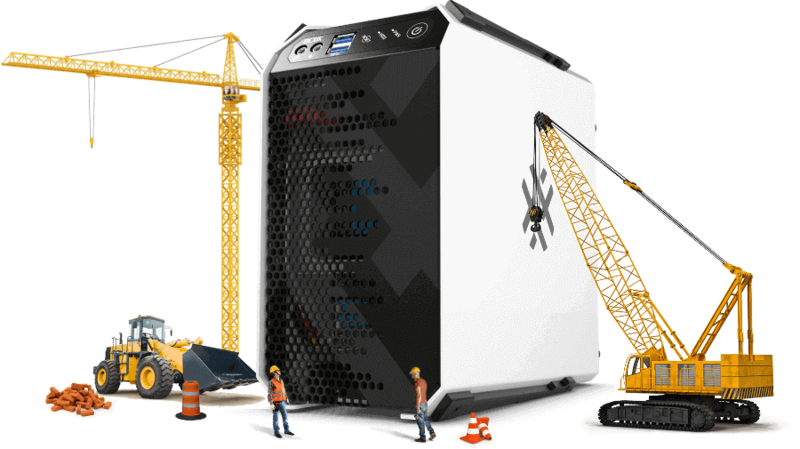 “HP was sort of the same way, but when we talked to the guys at BOXX, they’re actual SOLIDWORKS users and understood our challenges right away.” (BOXX uses SOLIDWORKS to design their own workstation and render node chassis). According to Tingley, none of the competitor systems they previously evaluated had the “fit & finish and level of support” demonstrated by BOXX.